In the past 50 years, we have made real progress on many social issues because of people like you – nonprofit managers, social entrepreneurs, educators and students – sparking interest in issues impacting the world around them. In his speech at the 2016 Aspen Ideas Festival, Secretary of State John Kerry noted, “Overall, a child entering the world today is more likely than ever before in history to be born healthy, to have vaccinations, to be adequately fed, to be able to get the necessary education and more likely to live a long life.” We have every reason to be confident in the future, but we also need to “make the right investments” to continue this progress. The Aspen Institute has been at the epicenter of sparking conversations that lead to action. 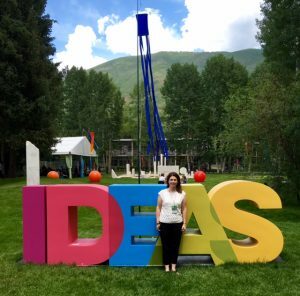 As Walter Isaacson points out, “The Aspen Institute brings people together with different outlooks to search for common ground and make the world a better place.” At this year’s festival, I attended more than 30 sessions and had deep conversations with people from across the U.S. Throughout these discussions, four domestic issues surfaced as the hottest topics in the social sector and in our political discourse. Criminal Justice Reform – America is the world’s largest jailer. More than 2 million Americans are incarcerated and another 70 million Americans have a criminal record. In many states, people of color are three to 10 times more likely to be incarcerated. In fact, our incarceration number is higher than the total number of students in U.S. colleges and universities. At the Aspen Ideas Festival, Senator Cory Booker called prisons “holding pens for addicts, those with mental health conditions and debtors.” Without question, there is a need for reform, but panelists suggested a holistic look at the system rather than one silver bullet. Many pointed to a connection to mental health – 71% of incarcerated juveniles have mental health issues (and are often first diagnosed when entering the criminal justice system). This has led many to worry about a school-to-prison pipeline. There have been some sparks of success, though. For example, New Jersey has been reversing these trends by increasing the efficiency of the parole process and allowing leniency in the sentencing of low-level drug offenders. In addition, the federal government recently piloted Second Chance Pell, which helps fund education programs at 67 colleges and universities for incarcerated students. Taken together, the sobering data along with signs of success have led many to advocate for the Reverse Mass Incarceration Act, which incentivizes states to reduce the prison population by as much as 20 percent. 2-Gen Approaches – We have written extensively about the value of 2-generation approaches – linking programs for parents and children together. Now, we are moving beyond programs and thinking about how systems can be better constructed to support parents and the needs of their children without sacrificing one for the other. In large part, this is due to the national drumbeat for quality early childhood learning – both at home and in centers. Brain research has catapulted our efforts, and we now know that talking, reading and singing throughout early childhood is crucial to brain development. As Jackie Bezos noted during her keynote, “children’s brains are like construction zones – they need brain fertilizer to grow.” To make it easier on parents, her foundation has launched an app – Vroom – to turn “everyday moments into brain-building moments.” Former President Bill Clinton has also joined the cause, starting an early childhood education awareness campaign called Too Small to Fail. And, research is connecting the benefits of early childhood education with social and emotional development. Food – Some predict that food is the single biggest election issue not being discussed. How we eat impacts our health, our environment and our economy. Food has become an issue of social justice as well as equity. Low-income Americans often have the worst diets, leading to a reinforcing loop of poor health, higher healthcare costs and reduced productivity. Now many are talking about how we can tie issues like hunger, obesity and food waste together in a system that better supports all of our goals. Many are calling for another White House Conference on Nutrition. The last one was held in 1969, and it led to many successes, including WIC, consumer protections and increased education. Health – In our last blog, we covered the Spotlight on Health pre-conference. We are excited about five trends – creating a culture of health in American communities, using precision medicine to deliver customized healthcare, leveraging technology for breakthroughs, treating mental health as an equal player in overall health, and acknowledging the important role public health plays in keeping us all healthy and safe. We hope you enjoyed this snapshot of the hottest social trends and sparks of success happening across the country. We would love to hear from you about this list and what conversations you hope are sparked during the upcoming presidential election.